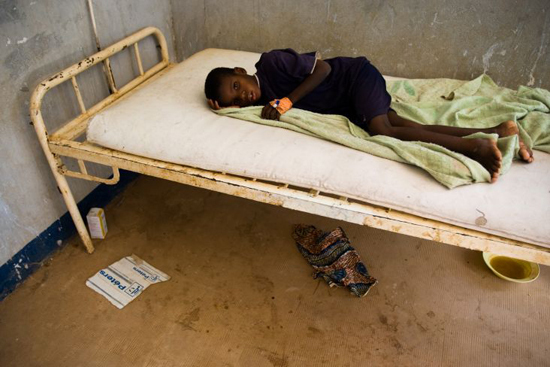 A 7-year-old boy with meningitis recovers after five days of treatment at the district hospital in Dosso. This year’s meningitis outbreak in northern Nigeria has already led to the deaths of over 1,500 people. Doctors Without Borders/Médecins Sans Frontières (MSF), in cooperation with the Nigerian Ministry of Health, is carrying out a mass vaccination campaign as well as undertaking the very important task of treating the patients who are suffering from the disease. In a hospital bed in the scorching heat of the Nigerian dry season, where temperatures can reach high into the 100s, Ismael lies still. He is eight years old and has just been brought to the Musawa General Hospital, in the north of Nigeria in Katsina State, by his father. He awoke at home in the middle of the night complaining of a headache and a stiff neck, two of the classic symptoms of meningitis. As he made it to the hospital quickly, he is well on his way to recovery, the appropriate antibiotics having been administered. A small, 5-month-old baby just two beds away has not been so lucky. He is breathing furiously, his tiny chest heaving, his father trying to comfort him. The baby is having a seizure and the doctors predict he is unlikely to make it through. “You can tell when you are in a health facility, which child has meningitis because of their position. They don’t even want to move. Their eyes are covered because the light hurts; they are breathing quickly because they have a fever or they are in pain,” says Susan Umstat, an MSF nurse, has been working in Zamfara State since the beginning of the emergency. 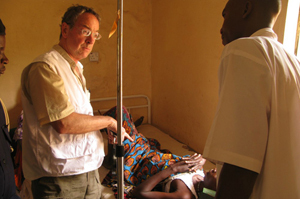 MSF medical staff visit a health center in Jigawa State to support treatment of patients with meningitis. Meningitis has been taking its toll on the north of Nigeria since January this year, when the first cases were reported. Nigeria sits within what is commonly known as the ”meningitis belt”. “Large meningitis outbreaks in this region typically occur every 10 years,” says Dr. Idriss Halliru, the director of public health for Katsina State in Nigeria. “The last big outbreak was in 1996. So since 2006 we have been expecting a big epidemic. This year has been particularly bad in terms of the number of cases seen.” Nigeria has been the most affected country within this belt with over 50,000 cases reported since the beginning of the year. Around 1,500 people have died in the country as a result of the disease. Although the number of meningitis cases is decreasing in many parts of northern Nigeria, teams are still seeing thousands of cases weekly.